The series "So tell me. . . about Hiroshima," in which hibakusha shared their feelings and life experiences with our reporters, began in April 2008 and today marks its 200th article. Since 2015 marks the 70th anniversary of the atomic bombing, as part of our commemoration we interviewed Mr. Sunao Tsuboi (89, living in Nishi Ward, Hiroshima), a leader in the movement to abolish nuclear weapons and one of the chairpersons of the Japan Confederation of A- and H-bomb Sufferers Organizations (Nihon Hidankyo), about his A-bomb experience and his views on peace. There was a silver-white flash and he instantly covered his face with his hands. On August 6, 1945, Sunao Tsuboi was exposed to the atomic bomb explosion on a street in Fujimi-cho (present-day Naka Ward, Hiroshima), 1.2 kilometers [3/4 mile] from the blast center. He was blown about 10 meters [33 feet] by the blast. At the time, Mr. Tsuboi was a 20-year-old senior student at the Hiroshima College of Technology (present-day School of Technology of Hiroshima University). As a boy raised under Japanese imperialism, he received a militarist pre-war education. His first reaction was to say, "Damn you, Americans! How dare you do this? You'll regret it!" But as soon as he became aware of his physical condition, his bravado evaporated. His clothes were tattered, and blood streamed from his arms and dripped from his fingertips. Dark red blood was oozing from his hip. He soon came across a girl student poking her right eyeball, which was hanging from its eye socket. He also saw a woman pressing her hands on her abdomen, trying to keep her intestines from protruding. "Help me, please help me!" He heard the cries of people trapped under collapsed houses, but he couldn't jump into the sea of fire to save them. Later in life, he dreamed of this scene many times and asked himself, "Why wasn't I able to help them?" In his flight to nowhere, he heard some women saying, "A temporary clinic has been set up at the Miyuki Bridge." He somehow managed to crawl his way to the bridge, but once there, no treatment worthy of the name was provided. "This is the end," he thought, and with a small stone, he scratched on the ground as follows: "Tsuboi died here." It was meant to be his last words. But soon some military men came on a truck and one said, "Young man over there, hurry up and get on!" He wanted to thank the soldier and asked his name, but he said, "My name doesn't matter. Get well soon and kill as many enemies as you can," and gave Mr. Tsuboi the shirt he was wearing. "If he had abandoned me then, I wouldn't be here today." It was the first time he felt he was given a chance to live through the support of people around him. But the same soldier was also shouting, "Only young men get on board! Others back off and wait!" It made him angry to see that some people's lives were valued lower just because they were of no use in fighting war. A Chugoku Shimbun [newspaper] photographer took a back shot of Mr. Tsuboi while he was squatting on the Miyuki Bridge about three hours after the bombing. That photo is now displayed at the bridge and in the Hiroshima Peace Memorial Museum. "To repay the people who helped me survive, I want to keep telling about the preciousness of life." 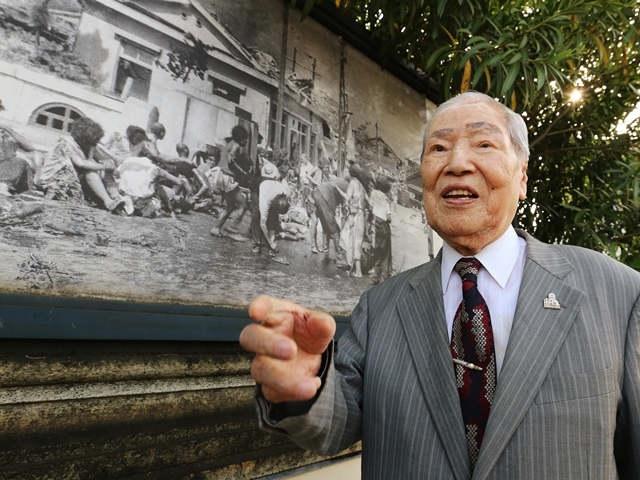 The memory of that time imprinted on the photo was the starting point of his involvement in the hibakusha movement. After being treated in a field hospital on Ninoshima Island (present-day Minami Ward, Hiroshima), he was sent back home to Ondo-cho (present-day Kure City). He didn't regain consciousness for about a month, during which time the war came to an end. After a period of convalescence, he became a schoolteacher, teaching mathematics in local schools such as Ondo-cho Junior High School. He called himself, "Mr. Pika-Don" ["Flash" - "Bang"]. "The term "atomic bomb" is difficult for children to grasp, but "Pika" and "Don" are easy to understand. When I walked down the street, they would often call out to me, "Hello, Mr. Pika-Don!" Every year when August 6 drew near, he said to his students, "Today we have no class. Just listen to my story," and changed his mathematics class to "Peace Studies." 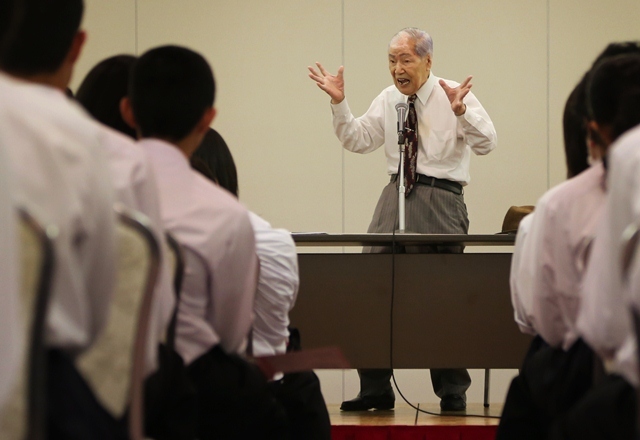 He would tell his students, "Remember the horror of atomic bombs long after you become adults." In 1986 he retired from his job and devoted himself full time to the hibakusha movement, assuming the post of co-chairperson of Nihon Hidankyo in 2000. He has toured 21 countries, including the U.S., France and other nuclear-armed states. He has also met bereaved families of the September 11 attacks. "I have come to realize the obvious truth that not all the people in the U.S. are bad. Now we can work together with them." He attended the Ministerial Meeting of the Non-Proliferation and Disarmament Initiative, which met for the first time in Hiroshima in April this year . In front of the foreign ministers of 12 countries, he told them how he had been hospitalized 12 times and on three occasions had fallen into critical condition. He stated, "My experience is not a fiction in a novel or a film. We must never again repeat this tragedy." Toward the Abolition of Nuclear Weapons: "Never Give Up!" On March 11, 2011, he first learned about the Great East Japan Earthquake while he was giving a speech in Beijing, China. He quickly changed his schedule and went back to Japan early. Nihon Hidankyo sent a letter requesting the Prime Minister to keep close records of each victim of their place and condition at the time of the earthquake and nuclear disaster, as well as where they moved after the disaster. The request came directly from lessons learned of the hibakusha, who dispersed all over the country after the atomic bombing, making it difficult for them later on to identify and recollect their situation on that day. He also has one regret. It was only after the Fukushima disaster that Nihon Hidankyo decided to clearly set a policy against nuclear power plants. Before that, some people in the organization were cautious about adopting such a stance. "Human wisdom cannot completely control nuclear energy and cannot overcome problems of radiation. Nihon Hidankyo should have come to this conclusion much earlier, since we had the experience of the Chernobyl accident." At Hidankyo's annual meeting last April , he was again elected as a co-chair. When he said, "I believe this will be my last service to the organization, but having decided to accept the position, I am determined to serve to the best of my ability, as long as I can breathe," the many hibakusha gathered from throughout Japan applauded warmly. As the hibakusha grow older, some hibakusha organizations have no choice but to disband. He believes that Nihon Hidankyo should not stay the same as before. "It should change from an organization for the hibakusha into one that will work to defend peace and the lives of people everywhere." When asked, he sometimes gives his testimony about his A-bomb experience before two groups of people in a single day. And he always concludes his lecture with the same appeal: "I am fully aware that abolishing nuclear weapons is not easy. But I am speaking before you in the hope that our movement will grow bigger even a little. We must keep going on. And never give up!" Mr. Tsuboi continues to bear testimony to his A-bomb experience, even though he is on an IV drip every two weeks. He speaks passionately with lots of gesticulations for about an hour without sitting down. Sometimes he shows a trace of fatigue after speaking. But he continues to do it despite the physical burden, because he feels the urge to fulfill his mission as someone who directly experienced the A-bombing. In March 2014, the number of those holding the official designation as hibakusha fell below 200,000-now about half of its peak. Mr. Tsuboi is alarmed by the dwindling number of fellow hibakusha who shared the awful experience of "those days," and the fact that eventually there will be no more survivors. Day by day, he feels his sense of mission growing stronger. The reporters in charge of "So tell me. . . about Hiroshima" are mostly in their 20s and 30s, including myself. Given that the time left for the hibakusha is becoming less and less, we feel more and more determined to confront the sense of mission that the hibakusha face. Every hibakusha who has shared his/her experience with us remembered those days very clearly. If there had been no atomic bombing, that day would likely have ended as just another hot summer's morning. Whenever I see lightning in the sky or hear a big sound, I now instinctively think, if this were "that day," how would I talk about it later? As long as we live in a nuclear-armed world, there is no guarantee that an atomic bombing will never happen again. We can't say that we won't become hibakusha ourselves in the future. This fills me with a sense of terror. This is when security systems that depend on nuclear weapons fill me with a feeling of emptiness. One year has passed since I first came to Hiroshima and began listening to the stories of the hibakusha. The desire to abolish nuclear weapons, which I had always thought of only as an ideal, seems now to have become an essential part of me. <hibakusha testimonies now available in video in Japanese> Asahi Shimbun has started a project of recording the testimonies of hibakusha in videos and making them available for the general public. They will be uploaded and updated as needed on the Japanese website of Asahi Shimbun Digital (http://www.asahi.com). Some past articles of "So tell me. . . about Hiroshima" are available in Japanese on the special page "Reflections on nuclear and life" (http://www.asahi.com/special/nuclear_peace/). * Originally published in Japanese in the series "聞きたかったこと [So tell me. . . about Hiroshima]," The Asahi Shimbun (Hiroshima morning edition), June 11, 2014.